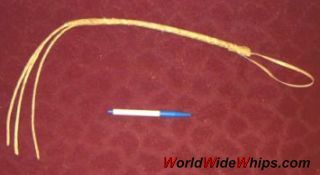 Riding whip from Bolivia, completely made of rawhide (including handle core). Braided from a single piece of goat rawhide around a rolled rawhide core, 12plait handle dividing into three 4plait tails. Very small (1.5 ft) and light as paper, but still quite effective.